FROZEN DOOR LOCK? MIX A SPRAY BOTTLE OF SALT WATER, AND SPR - ProudMummy.com the Web's Community for Mums. FROZEN DOOR LOCK? MIX A SPRAY BOTTLE OF SALT WATER, AND SPRAY THE LOCK IN THE MORNING, AND AT NIGHT. 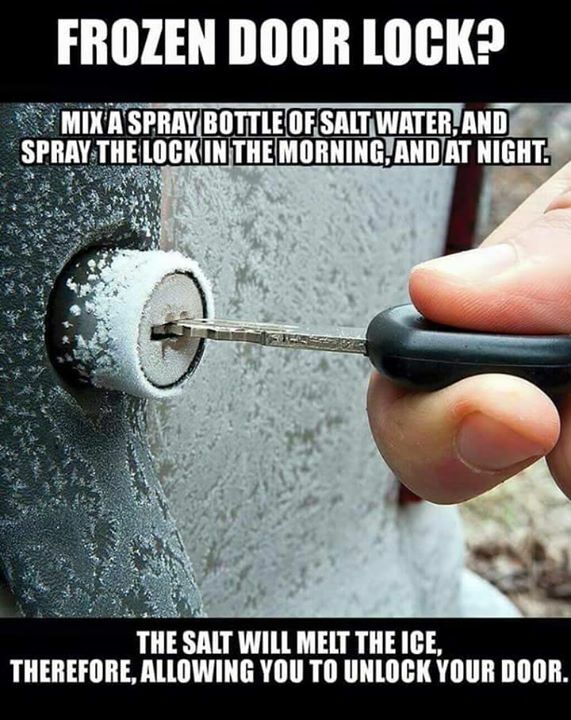 THE SALT WILL MELT THE ICE, THEREFORE, ALLOWING YOU TO UNLOCK YOUR DOOR.